I just started baking in March of this year and made an Easter Basket Cake for a coworkers family gathering. The bottom 2 layers were Red Velvet the top two layers were chocolate. The filling and icing were a Buttercream Creme Cheese icing recipe I got from Edna of "Design Me A Cake", which I met on facebook, Thanks Edna. The decorating : Bottom layers were covered in Satin Ice brand Fondant which I colored a powered blue color. After applying fondant I then added the quilting pattern and placed little white candied pearls at the cross sections. The top layers were all Butter Cream piped in the basket weave pattern ( my 1st basket weave, next time it will be tighter). The decorations on top were all made from gum paste, I made Easter eggs, jelly beans and flowers. The handle of the basket (also gum paste) was quite a challenge. I made it several days in advance and braided it. To determine the width that the braid needed to be I used the bottom of pan that I used for baking the top layers I believe I used a 6 inch pan but not sure. I used the extra thick straws in the bottom layer to add support before stacking the top layers. I inserted long toothpicks as the bottom of the braid before it dried and inserted the toothpicks into 2 straws I placed into the top layers to help the handle to stand upright. I also used a dollop of icing into each of the straws in the top layers to help the handle to stay upright. I did some basic piping decorating on the rest of the cake. I need to learn when to stop. I think the cake was a bit too busy, BUT when it comes to Easter Basket the more the merrier I say. 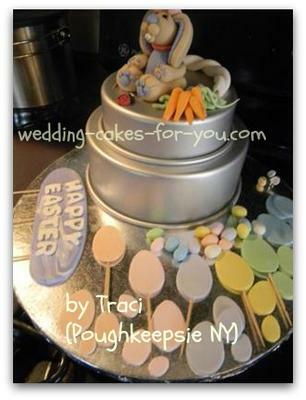 The Happy Easter sign and carrots also hand made of gum paste. Some of my decorations were hand made some I made using cutters. I used Royal icing to decorate the eggs and to adhere some of the decorations like the butterfly on the handle. Now for the bunny... having watched tons of cake decorating videos on making gum paste characters on Youtube, I honestly couldn't give proper credit to any one person as I made him on my own using tips I learned from many people. I made him in advance as I did many of the little decorations and the braid. All in all the entire cake took about a week from making characters to baking to stacking and decorating. She loved it! Cake decorating business??? As I said I just started baking about 2 months ago. I have found a new passion. At this time I'm in the "can I do this?" stage and am making a lot of free cakes/cupcakes for folks to get the word out to family, friends and coworkers. I am not charging anything because I know I cant technically do that without a license. Before I go down that road I need to see what kind of response I will get first. The Easter cake was for a coworker and I asked only that she cover the cost of the supplies ( which I definitely underestimated at ...$20.00). I hope I am not doing anything illegal of course but I see it no differently then if I agreed to paint her living room as long as she paid for the paint. I need to learn a lot about what I need to do to start a legal home based business according to the guidelines of the state of NY. I think I could make a success of this and I want to do it the right way, so advice is very welcomed. I am so very impressed with the level of help I have found on the internet. I was so happy to find "Wedding Cakes For You" as I have learned more here in the past few days than I have in the past few months on other sites THANK YOU LORELIE! 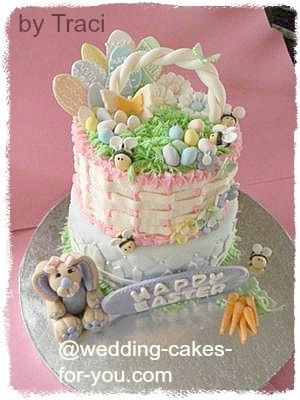 I hope you don't mind me sharing my Easter basket cake story and pics. My next cake is for our Memorial Day BBQ at the office this Friday. I am currently working on the Picnic Table cake I found on the Wilton website under "cake ideas" section. I would love to share how it turns out next week. 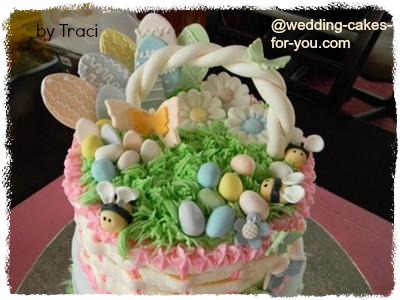 I've just viewed your Easter basket cake and so much enjoyed the story attached to it. The cake looks amazing and you should rightly be proud of your achievement. Good luck with all your other projects and enjoy your new found passion, its the most pleasant way to 'waste time'. Thank you for sharing.